Located west of Narbonne (Languedoc), in the heart of the Corbieres area, Ollieux Romanis is a beautiful estate (also refered as Chateau) surrounded by 70 hectares of vines, which belongs to the same family since 1860. The first parcel (small vineyard's plot) of Carignan grapes, still in use, was planted in 1896 in the heart of "Coume Romani" (also spelled "Combe Romaine" in French, and refering to the uppermost part of the valley, near the estate), which explains the name of "Romanis". "Les Ollieux" is the name of the few remaining olive trees next to the cellar, which were far more numerous before the frost of 1956. The ancestors of the actual owners chose the olive tree (also known as the poet's tree) as the emblem for the estate. The "olive tree coming out of a crown" emblem (or logo) features on the label of all the 11 wines produced at Ollieux Romanis. It is with the settling of the Bories family at Les Ollieux in the mid-19 th century that major irrigation work was performed on the property. The wine and aging cellars were built in 1896 using original stone from the estate’s quarry. The family’s dedication to the estate, and skilled utilization of both traditional and modern techniques continues to contribute to the production of a portfolio of superb wines. In 1978, Jacqueline and Francois Bories took over the domaine belonging to Jacqueline's godmother. The estate was divided in 1872, after family inheritance, therefore the terroir of Boutenac (the village and valley of the same name where the estate is located, in the Corbieres), has two sites with the name of Ollieux, sharing the same buildings around a big courtyard. In order to avoid confusion, the Bories family associated the name of "Romanis" to the initial name. After university, Jacqueline chose to go back to school to learn about agriculture and bring "back to life" the estate and its landscape. In 1984, she hired an estate manager, Jean-Pierre Amigues and since then, together, they manage and supervise the work in the vineyards and in the cellar. Although Jacqueline was born in a winegrowing family, Francois (her husband) evolved in the wine world without having any affiliated winery in his family. By taking over Ollieux Romanis with his wife, he finally realized his dream and quickly started to gradually buy all the best neighboring parcels, whenever he was able to. From 1980 to 1990, Jacqueline and Francois restructured the entire vineyard. A public notary during the day (which by the way, is a much more highly regarded and established job in France than in the US), passionate about history, Francois keep an attentive and protective eye on the two treasures of the estate: the old bookkeeping of the estate carefully consigned since 1875 and the last few remaining bottles from the XIXth century, buried in the sand, that he only opens on exceptional occasions. Francois even rehabilitated the old labels created in 1898 for the Vin de Pays Alicante and Carignan. Until the end of the 90s, the wines sale and marketing was ensured by a group of producers from the Languedoc, then by a British Negociant. However, in 2001, the deficiencies of these two networks proved inneficient, Jacqueline and Francois asked their elder son to help them at the estate. So, Pierre abandonned, sooner than he thought, his job as "golden boy" for the bank IndoSuez, in order to restructure the marketing network of his parent's domaine. In a crisis context, he succeded to find new markets, and, 4 years later, all the wines were bottled at the property and sold through new network. In paralel, he reposiotioned the brand, with new labels created by his sister Aude, graphiste-designer in Barcelona (spain). Each harvest is handpicked and transported to the winery in small, stainless steel vats. A number of grape varieties are vinified using whole grapes (known as carbonic maceration), while others are de-stalked, ensuring that each variety expresses the best characteristics in the resulting wine. Specially selected varieties mature in oak casks in a wine cellar where the temperature and humidity are naturally regulated by the thick walls and stone cistern which harbors natural spring water. Today, as always, the domaine practices traditional culture management of the soil with organic compost to ensure scrupulous protection of the vineyard. This process allows a natural, sustainable culture oriented operation, in respect for the vines and especially the environment. Within the next few years, it wouldn't be surprising if they become 100% organic. Protected from the winds of north, and planted on the southern/south-eastern side of the “Pinada” massif (small mountain), the vineyards of Ollieux Romanis counts 70 ha of vines planted of only one holding, including 21 ha of carignan, more young ages the 50 years, oldest 109 years. The syrah, with an average age from 15 to 30 years, covers 11 ha just like the black grenache (40 years for oldest); the mourvèdre, 5 ha (17 years); Alicante 2 ha; the gray grenache 3 ha and of cinsault 1 ha. For the white, roussanne and marsanne, 15 years old, occupy 4,5 ha. The diversity of the soils allows for a great diversity of wines bottled depending on the grape varieties and the parcel of origin: one is argilo-limestone, the other is composed of red grounds with rolled rollers and gravette, while an exceptional small island of conglomerate rests on sandstone. 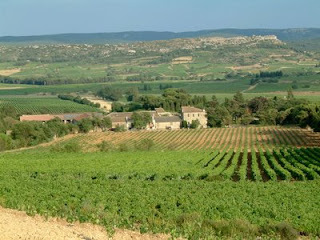 Ollieux Romanis produces 11 differente wines: 8 reds, 2 whites and 1 rose. Ollieux Romanis single grape variety wines: Alicante and Carrignan, are absolutely delightful and surely the best representations of what some of the oldest vines in the Corbieres area can produce. A blend of 70 % Carignan vieilles vignes (old vines) and 30 % Grenache noir, from 60 to 100 years old vines planted on sand and calcareous clay soils, this wine experienced a whole grape maceration and short cuvaison in order to maximize the fruit aromas and flavors intensity. Beautiful, intense dark robe with brilliant, purple sheen. Clean and aromatic, the nose suggests surprising notes of red fruit and wild berries. The palate is juicy, well-balanced, round and medium to full-bodied. A pleasing, easy drinking, versatile, earthy red that will be an ideal sipping wine to complement a late afternoon BBQ with family and friends.